To enhance A.R.E.’s Deluxe Commercial Unit, customers order in advance when specifying options on their truck cap so the LED lighting is installed at A.R.E.’s manufacturing facility. Then, when they pick up and have their DCU truck cap installed, the lighting is already set up and ready to plug and play, exactly as ordered. A.R.E.’s LED options are rated for 100,000 hours. Options include dome lights, rope lighting, rear door lighting and exterior lighting. In addition, A.R.E. 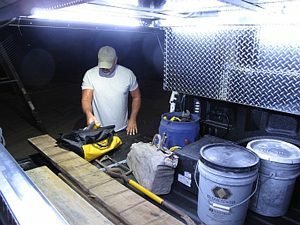 has teamed with Rigid Industries to offer ultra-bright work lights for nighttime work. The Rigid Industries options include 36- or 48-in. bar lighting, which can be positioned on the front of the cap to shine directly on the project at hand, or to light up an entire work space.